Preheat oven to 350 degrees F. Lightly coat a 3-quart baking dish with cooking spray; set aside. In a 12-inch skillet, cook sausage over medium heat until brown. Drain off fat. Return sausage to skillet. Meanwhile, halve zucchini lengthwise; cut crosswise into 1/4-inch pieces. Add zucchini to sausage in skillet. Cover and cook over medium heat for 2 minutes; remove from heat. In a small bowl, combine soup and sour cream; stir into sausage mixture. 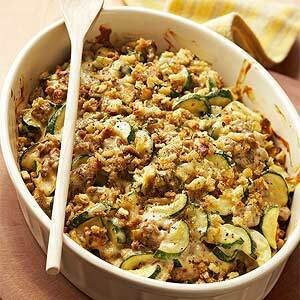 In a large bowl, combine stuffing mix and broth to moisten. Spoon half of the stuffing mixture into the prepared baking dish. Spread sausage mixture over stuffing in dish. Spoon the remaining stuffing mixture evenly over sausage mixture. Drizzle with butter. Bake, covered for 15 minutes. Uncover and bake for 20 minutes more or until heated through and top is golden.